Want to ship your packages abroad from India? What You Can Get Us to Courier? Ever wondered how to access 1000s of Indian E-commerce Stores without an Indian Address for delivery? If at all you are able to shop from different E-commerce platforms, you often face heavy costs and International shipping is a tedious & complex process for many. Or more often you end up troubling your relative in India to buy the items, pay for them, store them, pack it and find a place to courier them. Worry no more! We have all this covered for you! 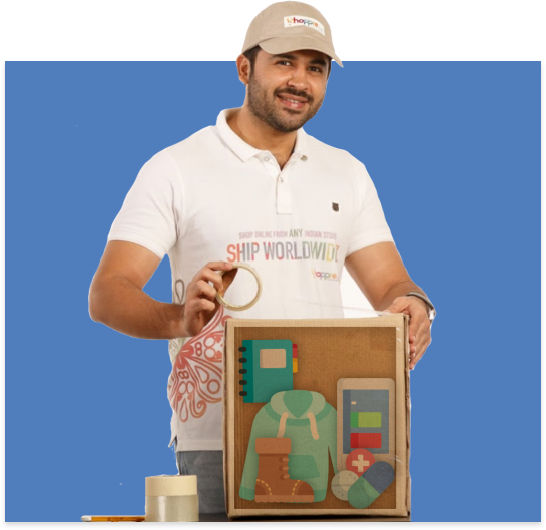 ShoppRe.com provides a first class International Parcel Forwarding Service from India allowing those who reside outside India to purchase their favorite products from India and get it shipped to their doorsteps at an optimized rate and in a hassle-free manner in 3-6 days. We provide a FREE Indian Shipping Address or a Virtual Address in Bangalore. You can use this as address as the delivery address while checking out at any E-commerce Platform like Amazon.in, Myntra, Flipkart, Jabong, Ajio, Jaypore etc or any FB/Instagram Sellers. Your items will reach ShoppRe warehouse and you will be notified by Email. You are provided 20 days of FREE storage period within which you can purchase from various platforms and accumulate as many items as you want in your locker. In the end, we will repack & consolidate all these into one package and get it shipped to your doorstep ANYWHERE in the world in 3-6 business days! This storage, repackaging, and consolidation reduces the cost up to 60 - 80% as compared to sending them individually from each store. The Savings you make is 87% in Case 1. Imagine how much extra purchasing power this would give you in a month, in a year and in a lifetime! Good so far, but how does this make the shipping process hassle free? We take care of the invoicing, customs process and all the paperwork required for export clearance from India. We will notify you at every step and also have a 24/7 customer support which guides you at every point and clarifies all your doubts and queries. You will receive a tracking code as well to get the status of the shipment once dispatched from our facility. However, once the item reaches the destination country, customs duties would be as per the rules of the same and would not be under our control. Hmm, what if I don't like the stuff ordered and need to return it? 2. Return Services - In case you are not happy with the product, you can raise a return request with the E-commerce partner (as per their return policy) and we will assist you to return the item to the Store. However, once the item has reached your doorstep abroad, we cannot arrange for a return. You will have to send it back as a fresh import to India and this may work out to be pretty expensive. Sometime I try to shop online but my debit/credit card does not seem to work. Can you help? Yes we can. We have what is called Personal Shopper services where by you can tell us what to purchase and we purchase on your behalf. A small commission of 7% or INR 200 whichever is higher would be charged. So we do international shipping with online shopping from India. Can you give me an idea about who your customers are? - Many sellers/owners who run businesses outside India use ShoppRe as their hub in India for Fulfillment Needs & Inventory Management. They collect their inventory from different parts of India and store it in ShoppRe and distribute across the globe as per the orders that they receive. How is the shipping costing like?